The name of our scholarship has two meanings. The letters AMI are short for: Aboriginal, Métis, and Indigenous. These letters represent the people the scholarship is provided by and for. AMI also has a second meaning: "Ami" is the French word for "friend," which is fitting, because we want scholarship recipients to share their stories about earning a certificate from IAP Career College with their friends. International Association of Professions Career College, also known as IAP Career College, is a proudly Métis-owned private college. Therese (Tag) Goulet, Academic Director, and Catherine Goulet, Chair of the Board of Trustees, are Métis — Aboriginal Canadians of mixed Native (Cree, Ojibwe) and European (including French) descent. PHOTO: Tag Goulet of IAP Career College (in red) with her mother Terry Goulet, Hon. Donald S. Ethell, Lieutenant Governor of Alberta, and her father George R.D. 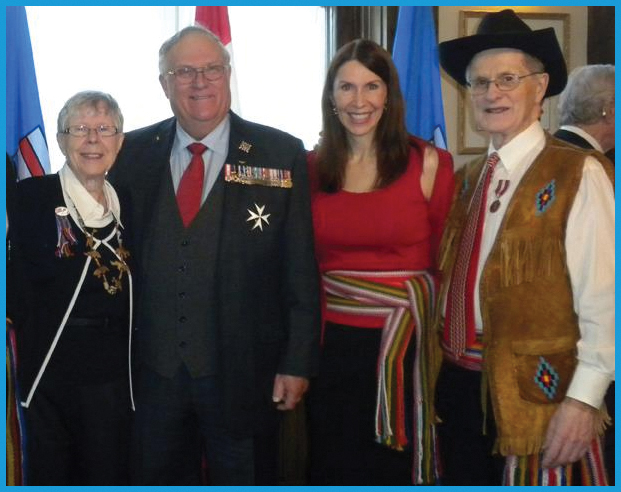 Goulet (right) after a 2012 ceremony where George was awarded the Queen Elizabeth II Diamond Jubilee Medal for his contributions in educating people about the Métis. Not an Indigeneous person or refugee, but need financial assistance? Please see our FAQ page for some of your options. Each scholarship recipient may be awarded the AMI Scholarship only once, for one certificate course offered by International Association of Professions Career College. 1. Obtain a scanned copy of an official document which provides proof of your membership in any of the eligible groups listed above. For example, it might be an official membership card, a letter from a recognized authority, a government document, or other verifiable evidence. 2. Decide how you want to share information about your successful completion of an IAP Career College certificate course. Choose the certificate course you wish to take. Click on the “Register Now” button on the webpage for that course. Confirm the cart shows the correct course then click “Proceed to Checkout”. Complete the registration form with your name, address, and other information. Click the “Proceed to PayPal” button which will submit your registration (but do not complete payment). Include a statement about how you plan to share information about your success in earning a certificate from IAP Career College after you finish your course. Attach a scanned copy of proof of your membership in one of the eligible groups (e.g. official membership card or other document from a recognized authority). Once your completed application is received, you will receive an automated reply. Each month up to 10 applicants may be selected to receive an AMI scholarship. Applicants will be chosen based on their potential for serving as an inspiration to other students. A maximum of 100 scholarships may be awarded in a calendar year. Each month’s scholarship winners will be notified by email by the 15th of the month (or the next business day if the 15th falls on a weekend). Students who are not chosen in the month they apply will have their application considered in future months, so you need submit only one application per calendar year. If you are awarded a scholarship, we will send you all the materials you need to start your IAP Career College certificate course by the next start date for that course.